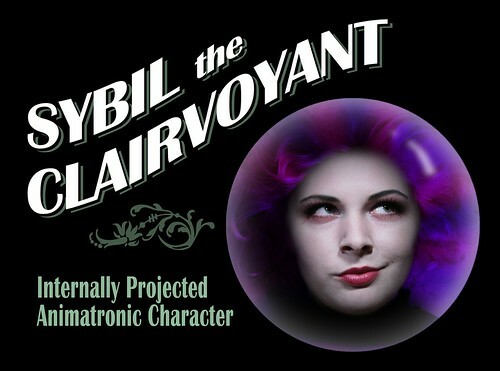 Sybil the Clairvoyant is the resident disembodied medium of Mr. Chicken's Prop Shop. She is available in Pro and DIY Kit versions. Watch your guests become completely mesmerized by this incredible illusion. Sybil conducts a séance that's sure to impress. The Professional versions of Sybil are completely self contained (except for a power cord), with the projected face coming from inside the head. The 2.0 also features animatronic head movement. She arrives ready to perform. 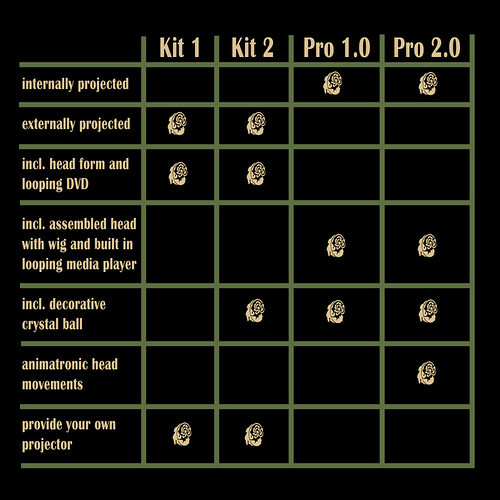 The Kit versions are priced for the home haunter's budget, and require your own projector to complete the effect. The video below explains how it works. Pro Sybils with internal projection are $1800 without head movement, or $2400 with head movement. Contact chickenhaunt@gmail.com for more info. Expect 2-3 weeks before shipment for Sybil kits, and 4-6 weeks for Pro models. Customers outside the US should contact chickenhaunt@gmail.com before purchasing for accurate shipping charges.